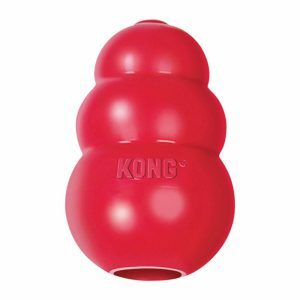 The KONG is a nontoxic, dishwasher-safe rubber toy with a hollow center. When stuffed with food, it provides dogs with a healthy outlet for their natural desire to chew and lick. KONGs come in many sizes, from very tiny to extra-large. Some are made for puppies with baby teeth, some are made for regular chewers and some are made for dogs with powerful jaws. There’s a KONG out there for every dog! Why Give Your Dog a KONG? Nature made dogs to hunt, forage, scavenge and work for their food—not have it delivered for free in a bowl! One reason dogs develop behavior problems is sheer boredom, resulting from a lack of physical exercise, problem solving and outdoor exploration and investigation. To make your dog’s life more enjoyable, you can give him fun “work” to do when he’s home alone or when you can’t play with him. You can stuff KONGs with almost any kind of food your dog likes. Feed him his meals in a KONG by mixing his regular kibble with a little canned dog food, cottage cheese, yogurt, peanut butter, canned pumpkin or mashed banana. After spooning the mixture into the KONG, you can use a bit of cream cheese or peanut butter to seal everything in. 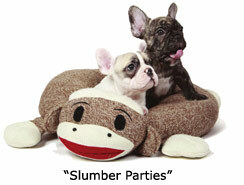 You can also fill your dog’s KONGs with special snacks to supplement his diet. See the recipes below for creative KONG-stuffing ideas. 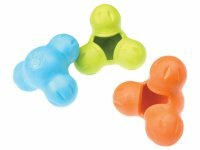 Dogs don’t automatically know how to use food puzzle toys. They need to learn how. When you introduce your dog to the KONG, you’ll need to make it easy for him to empty it so he doesn’t get discouraged and give up. Use small pieces of kibble or treats that will fall out of the KONG easily. When your dog learns how to use the KONG and can empty easy KONGs quickly, you can make his job more difficult. He’ll love the challenge! Use bigger pieces of food. Wedge chunks of fruits and veggies and larger biscuits inside the opening of the KONG. Make a KONGcicle! They’re great for spring and summertime outdoor enjoyment. First, put a dab of peanut butter at the bottom of the KONG to seal the small hole. Then turn the KONG upside down and place it in a cup. Stuff the KONG with kibble, canned food, cottage cheese, mashed potatoes, banana or anything else you like. Pour a little chicken broth or gravy into the KONG and freeze it overnight. Here are some of our favorite recipes. Give them a try—or make up special recipes of your own! Just be sure to avoid foods that can be dangerous to your dog, like onions, garlic, avocados, macadamia nuts, bread dough, grapes and raisins, moldy foods, artificial sweeteners, fatty cuts of meat and chocolate. 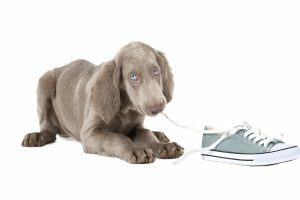 If you’re unsure about what’s safe to feed your dog, contact his veterinarian for advice and please see our article, Foods That Are Hazardous to Dogs. Drop the special treat into the bottom of the KONG. Then mix together your dog’s kibble and a few spoonfuls of canned dog food. Spoon the mixture into the KONG. When the KONG is filled, seal all the food inside using a dab of peanut butter, a smear of processed cheese or a little cream cheese. If you find that your dog can lick the KONG clean within just a few minutes, try freezing it overnight before giving it to him to satisfy him longer. Combine equal parts meat and potatoes or grain. Stir in a spoonful of beans and a sprinkle of raw grated or steamed and mashed veggies. Freeze the KONG overnight or serve it warm. Vegetables: Some that dogs like raw (grated or finely chopped) are parsley, carrots, zucchini, lettuce, bell peppers (green, red, orange and yellow), fresh corn, celery, tomatoes and beets. Some veggies that dogs enjoy steamed are green beans, broccoli, asparagus, cauliflower, potatoes and hard winter squash. In a soup kettle, cover the chicken with water, lightly salt and spice to taste, and add chopped veggies—celery, carrots, diced tomato, bell pepper, etc. If you’re using potato, add that to the stew as well. If you’re using grains, cook them separately. When the stew is done, you’re ready to combine everything. Put equal parts of meat and grain or potato in a large bowl, along with a tablespoon or two of the vegetables. (The vegetables should amount to about five percent of your dog’s meal.) Then spoon the mixture into a KONG. If you’re going to freeze the KONG, you can add some broth as well. First drop the fruit into the bottom of the KONG for dessert. Then mix together your dog’s kibble, the wet food or water, and the veggies. Put a spoonful or two of the mixture into the KONG. Then put a chunk or two of potato in. Repeat, layering the mixture and potato until the KONG is almost filled. Finally, cram the biscuit into the end of the KONG. Seal everything in with a dab of the vegetarian refried beans. Serve warm, at room temperature or frozen. Grate the bell peppers or lightly steam them. Chop the tomatoes into chunks. Then scramble one egg with a sprinkle of cheese. Spoon the cheesy egg and the veggies into a KONG. Seal the KONG with a small chunk of cheese. Serve warm. Cut the fruit into chunks and put them into a KONG until the toy is about two-thirds of the way full. Holding the KONG upside down, spoon cottage cheese or yogurt into the remaining space. Finally, finish by putting a small marshmallow into the KONG. Serve at room temperature or frozen. Put a spoonful of cooked oatmeal at the bottom of the KONG to seal the small hole. Then put two spoonfuls of pumpkin into the KONG. Follow with a spoonful of yogurt or cottage cheese. Repeat, layering the pumpkin and yogurt or cottage cheese until the KONG is almost full. Then cram a few pieces of graham cracker into the end of the KONG. Serve warm or frozen. Put a blob of peanut butter into an empty KONG to seal the small hole at the bottom. Add a few roasted peanuts. Mix the banana slices with a few spoonfuls of yogurt and the wheat germ. Then spoon the mixture into the KONG. Seal the KONG at the top with another blob of peanut butter. Serve at room temperature or frozen. Running late? If you’re busy and don’t have time to create culinary works of art, you can simply take a few seconds to try the following ideas. This is KONG stuffing at its fastest! Keep a stash of halved bananas in your freezer. When you’re on the run, just grab a banana half and slide it into a KONG. Or slice an apple into wedges and insert one or two of those into a KONG. Cram a large dog biscuit or two into a KONG. If necessary, squeeze the KONG when inserting the biscuits to change the shape of the hole and fit them in. If you feed your dog raw food, try purchasing frozen raw medallions, which easily pop into a KONG. Just turn the KONG upside down on a counter, large hole facing up, and push the medallion into the KONG using the heel of your palm. Use a squirt of Cheez Whiz®. Just insert the nozzle into the small end of the KONG and squeeze in some cheese. You can also use a similar product made by the KONG Company, called KONG Stuff’N™ Paste, which comes in liver and peanut butter flavors. Smear a spoonful of peanut butter or cream cheese (preferably low-fat) on the inside walls of a KONG. If you think that your dog might finish licking out the KONG too quickly, consider preparing a few peanut butter or cream cheese KONGs in advance and leaving them in your freezer for quick use when you’re in a hurry. Bon appétit! For more great recipe ideas and information on serving sizes and ensuring complete nutrition with home-cooked meals, we recommend Dr. Pitcairn’s New Complete Guide to Natural Health for Dogs and Cats by Richard Pitcairn, DVM; Real Food for Dogs: 50 Vet-Approved Recipes to Please the Canine Gastronome by Arden Moore; and Home-Prepared Dog & Cat Diets: the Healthful Alternative by Donald Strombeck, DVM, PhD. 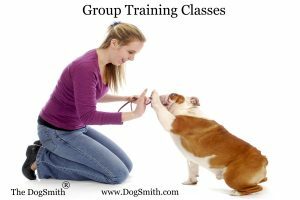 This entry was posted in Blogs To Help You Train Your Dog and tagged canine toys, dog, kong, mentall stimulation, stuffed kong on November 27, 2010 by DogSmith.